Christmas Creations RGB/DC controller is used in conjunction with our R2R Player and is used with all our Singing Faces and Christmas light frames.It can also be used with our RGB Mini-trees and other RGB products. This controller integrates seamlessly with our external 12V or 24V PSU and our Singing and animated light frames. Enclosure is screw-mountable and compact allowing easy installation in tight spaces - ideal for commercial and professional installations. 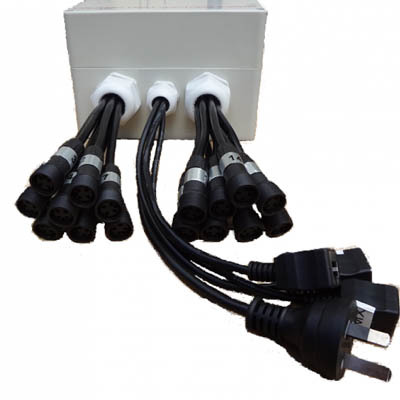 It features an IP67 rated high-impact ABS enclosure with waterproof male connectors (for direct connection to our light frames), heavy duty 2 pin screw-up DC power connector (for direct connection to our 12V or 24V PSU) and a screw-up waterproof RJ45 socket for ethernet connection. Custom programming services are also available for large displays or those with special requirements. Contact us for more information.